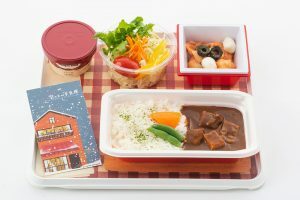 Japan Airlines (JAL) has been offering innovative inflight meal options under the concept of JAL Kitchen Gallery, featured in Premium Economy and Economy Class service. Starting December 1, 2018, JAL will be serving a fresh set of inflight meals supervised by the chefs representing JAL Royal Catering Co., Ltd., which was founded in 1992 as a joint venture between Japan Airlines and Royal Holdings Co., Ltd. The company currently serves over 14,300 meals per day on JAL`s international flights. JAL will continue to create meals that provide a fulfilling inflight experience for our valued customers.